Take advantage of our monthly service promotions. Look below to see what you can save on for this month. Give us a call if you have any questions. Complete the attached form in it’s entirety. Please be sure that all information is legible. Attach your original sales receipt showing your purchase of qualifying KW Suspensions product. Cut-out and attach the original UPC/barcode label off of original packaging. The following promotions are offered by the tire & wheel industry as well as ourselves and are available to all our local customers. Contact us for more information on these promotions. 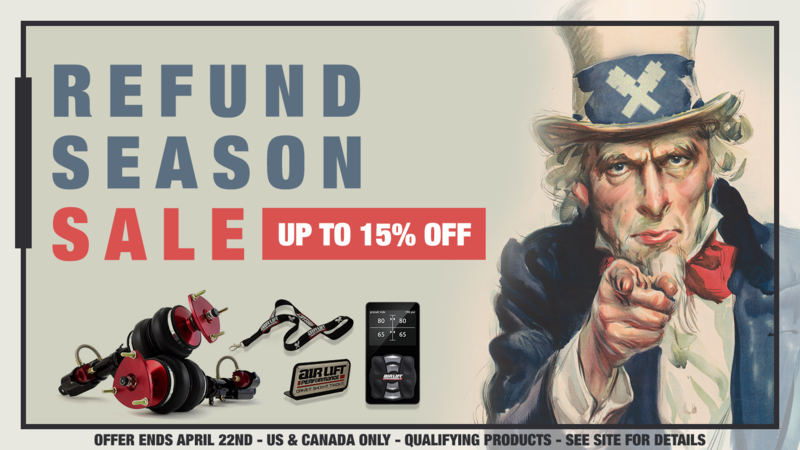 Air up those savings and enjoy a 15% UMAP discount on Air Lift Performance parts (excluding VIAIR products) throughout the month of April! Beginning November 1, 2018 through March 31, 2019, Air Lift is offering their newest consumer mail-in rebate with up to $150 back when qualifying products are purchased from AND installed by a professional installer. See attached form for complete list of rules and redemption instructions.